gst composition scheme is great news for the small business owners who are struggling with the regulatory compliance of new tax regime in the country. Eligibility And Benefits Of Registering under GST Composition Scheme How to opt for it? GST Composition scheme is great news for the small business owners who are struggling with the regulatory compliance of new tax regime in the country. Filing taxes thrice a month has turned into a hassle for the small business owners who don’t maintain proper books of accounts. Relaxing the tax paying obligations for the small business owner, the finance ministry announced composition scheme under GST that allows the business owner to pay a percentage of taxes on the total turnover rather than paying taxes under regular provisions of tax law. This will keep away the business owner from the hassle of maintaining books of accounts to adhere to the tax provisions as per law. There are many other benefits of GST composition scheme registration. Normal GST tax regime calls for business owners to file three returns monthly and one return annually. Failure to do so will draw a penalty for non-compliance. On the contrary, business owners qualifying for composition levy under GST will file tax returns quarterly based on the turnover which keeps him away from maintaining regular books of accounts and it’s supporting documents for tax filing. The tax liability for the business owner is greatly reduced for the business owner under composition levy scheme of GST. The rate structure of the composition is pretty low and less complex as it is paid on the turnover. Manufacturers pay 2% of tax which is shared between central and state equally. Food suppliers pay 5% rate on a same sharing basis and other suppliers are liable to pay 1% tax on turnover. However, the supplier should remember that he is not eligible to collect tax from the customer on the invoice. Normal GST regime blocks the capital of the business owner in input tax credit because; the benefit can be availed by them only when the supplier has filed the return. Under the GST composition act, the business owner need not worry about tax returns filed by the supplier because no input credit can be availed by the business owner. 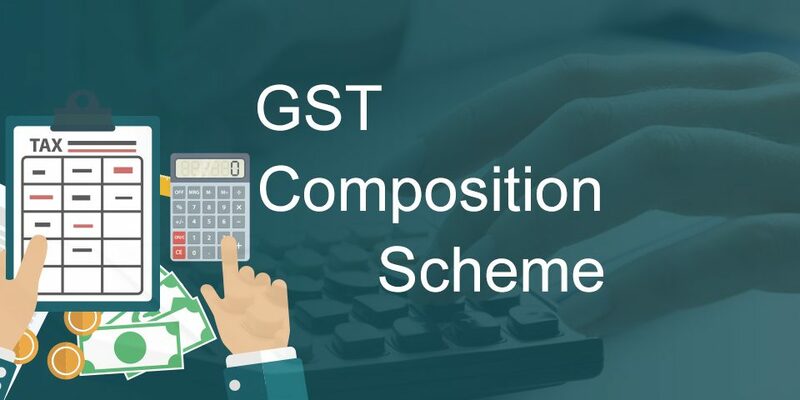 Who is eligible for composition scheme under GST? Opting for the composition scheme under GST is a voluntary decision. There are certain eligibility norms that have to be adhered to be the part of composition scheme. • The composition scheme is not available for service sector but in the case of restaurants, service tax composition scheme is 5%. The businesses deal with the supply of goods can opt for this scheme. • For your business needs to be eligible for the scheme, it should have only intrastate supply which means the business should be conducted within the state only. • Any business that sells goods through e-commerce portals like Amazon and Flipkart are barred from the composition scheme in spite of their threshold eligibility. • Composition scheme is levied for all business conducted with the same PAN, you will not have an option to choose composition tax for one and pay taxes for the other. Any existing taxpayer under GST composition scheme registration can choose it at the beginning of the next financial year. You should file an application for GST composition scheme registration before the 31st March of the previous financial year so that the returns can be filed accordingly. However, the business owner can switch to normal scheme from composition scheme any time during the year but not switch to composition scheme in the same financial year, Indian GST Tax Information.